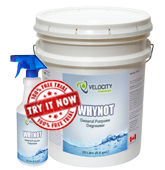 WHYNOT is a non-caustic, non-silicate, heavy-duty general purpose cleaner. It is highly efficient in the removal of organic soils such as grease, oil, bitumen, pitch and road film. Used to remove road film and oil/grease from mobile equipment or vehicles in heavy equipment shops, truck and car washes, railroads and mines. Safe to use on all metals and painted surfaces. Pre-soaking– use from 40:1 to full strength depending on soil conditions with a contact time of 2-5 minutes. Then, rinse with water. Foaming- use from ~2% (50:1) to 20% (4:1) with a contact time of 2-5 minutes. Then, rinse with water. High Pressure Washing and Steam Cleaning – use at 0.5 – 1% depending on surface dirt and soil condition. Rinse with water. Note: Applying solution at higher temperatures will improve cleaning performance. WHYNOT is safe on all metal and painted surfaces when used as directed.